If I bet on sports I wouldn't be sports betting too heavily on the '09-'10 Celtics, (that's a tip). With their three elder statesmen, and I mean elder, having logged over 3,000 regular season games, their short successful run may be over. Their pre-All Star performance shows more signs of aging than dementia. Since Christmas Day the Boston Celtics have dropped 13 of their 25 games. The roughest stretch of their three-season run, Boston's big three is showing serious signs of slowing down. 34-year old, 13 year veteran Ray Allen is having his worst scoring season since his rookie year in 1996, even his free throw shooting is down to it's lowest since 2004. As for the Celtics Big Ticket, Kevin Garnett, the past two seasons have had to be the toughest for him and Boston GM, Danny Ainge. 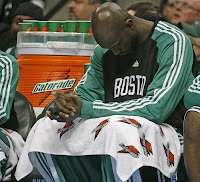 After missing 25 games and the postseason a season ago, Garnett has already been sidelined for 11 games this season. His 14-year career of averaging twenty points and nearly 11 rebounds a game is clearly winding down at the mercy of injured legs. For the 33 year old power forward, Garnett will play in his 1,100th regular season game this year, and this is the gamble Boston took in the summer of 2007. Finally, for the next to have his number raised to the rafters in Boston, Paul Pierce, games are beginning to take a toll. Averaging 75+ starts since his second year in the league in 1999, Pierce is going to have to rest his legs while trying to keep Boston in the Eastern Conference picture. Already missing 7 games this season and playing less minutes per game than he has since 2000, the signs of wear and tear are becoming less like signs and more like billboards. The three most recent second half let downs are signs of a similar aging. Two weeks back when the Celtics were game in hand beating the defending champion Lakers, it was a 24-16 fourth quarter that did Boston in on their own court. After ending the third with a 7-point lead and holding L.A. to just 66 points through three quarters, the Celtics were handled in the 4th and unable to respond. Heavy legs began to set in as the Celtics watched Kobe and Co. take over. After three straight wins, Boston again suffered a similar fate. Tearing up the Orlando Magic in the first half, the Celtics were dominated in the third quarter being outscored 36-11, with no answer they'd yet again fall to a future playoff opponent, the same team which dispatched them last season. Finally it would be their final game of the first half of the season that proved the point, they're too old and too slow. Facing a Chris Paul-less Hornets team, the Celtics would watch a 12-point half time lead dwindle down and head into the fourth quarter losing by five. A 4-11 shooting performance from Paul Pierce, 16-27 from the free-throw line, and 1-8 from behind the arc, the Celtics slipped, stumbled, then fell. An offseason of attempting to re-tool just hasn't panned out for Boston. After beginning the season injured, forward Glen Davis is averaging just 6 points and 4 rebounds in 22 games. Marquis Daniels suffered a thumb injury which has limited him to only 21 games this season. As for big offseason acquisition Rasheed Wallace, he's shooting just 40% from the field and averaging just 10 points and 4 rebounds a game. If the Celtic bench isn't able to hold leads and their starters continue to struggle in the second half, there is no way this team is going further than a first round exit. As point guard Rajon Rondo continues to impress (#1 in the league in steals per game, and #4 in assists per game) it's time Boston begin to think about rebuilding and that starts first with getting younger. 0-4 against Atlanta, and 1-3 vs. Orlando doesn't bode well for a team looking to make a playoff run. With a 4-game road trip beginning the second half, in Sacramento, in Los Angeles, at Portland and Denver, Boston has a tough road ahead of them. 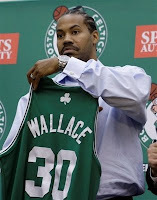 Like I said, If I bet on sports I'd be staying away from the Celtics.